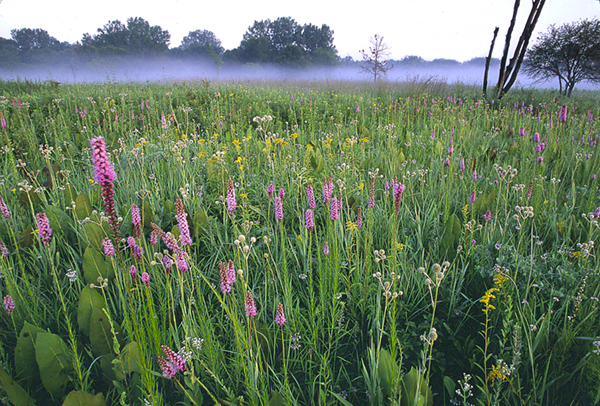 The Wolf Road Prairie Nature Preserve savanna located at the northwest corner of 31st Street and Wolf Road is ranked globally critically imperiled according to the Chicago Wilderness Biodiversity Recovery Plan. This makes it one of the rarest natural areas on Earth. The Wolf Road Prairie Nature Preserve also contains a globally imperiled black soil prairie recognized as the finest and largest prairie of its kind east of the Mississippi River and a large centrally located wetland. These ecosystems provide habitat for countless species of wildlife. More than 370 species of native plants are known to the preserve. Some are listed as threatened and endangered. The origins of Wolf Road Prairie date back 12,000 to 15,000 years to a time when our geographic region was recovering from the last Ice Age. As the climate warmed, the mile deep glacier which covered what is now northeastern Illinois began to melt. The first humans arrived here following migrating herds as prairie and hardwood forests gradually replaced the tundra and stands of coniferous woodlands. Clovis points have been discovered in the Salt Creek vicinity. This ancient land of Wolf Road Prairie remains today as a historical record of those long ago times. From early spring until autumn’s first frost, Wolf Road Prairie is a constantly changing landscape of colors and textures as vibrant wildflowers bloom and grasses grow tall. Wolf Road Prairie is famous for its stunning display of fragrant wild hyacinths which carpet the savanna understory with pale blue spiked blossoms in the spring. This spectacle is short lived and lasts about a week depending on weather and temperature conditions. You can stand here in the presence of the “mother bur oak” believed to be well over 200 years old. This tree was a sapling when Native Pottawatomi lived in the area and Illinois was still a vast pre-settlement wilderness. Wolf Road Prairie is a haven for migrating and nesting birds and a nectar-rich feeding ground for a myriad of butterflies, culminating in late August and early September as Monarchs fly southwestward to their wintering grounds in Mexico. 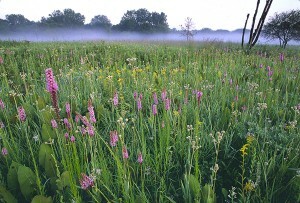 Wolf Road Prairie is owned by the Forest Preserve District of Cook County and the Illinois Department of Natural Resources. The Illinois Nature Preserves Commission oversees management and protection of the site. The Salt Creek Greenway Association is working in partnership with Wolf Road Prairie landowners. They host workdays and prairie tours as a public service.